Since 1975, only eleven women architects have been recognised with an Australian Honour, and only one between 2012 and 2016! The first problem is that very few are nominated. Ruth McGowan urges us to correct this imbalance, and explains how to get started. “She deserves a medal.” How many times have you heard this said about an amazing woman? Perhaps you’ve even said it yourself about an outstanding woman architect? Public awards, such as those conferred through the Australian honours system, can assist in bringing about the cultural, unconscious bias shift that is required for women to achieve due recognition and leadership equality. 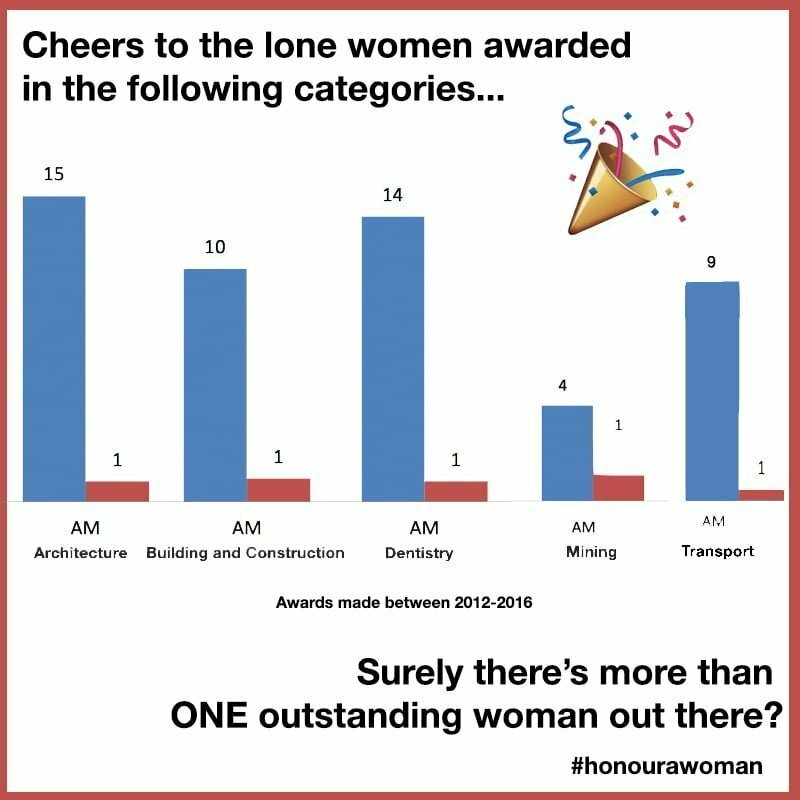 Sadly, Australian architecture has a very poor record for honouring outstanding women across the profession. In fact, only a handful of women architects have ever been recognised with an Australian honour in the long history of the awards. But you can change this. The Australian Honours and Awards system, affectionally known as ‘The Gongs’, were established in 1975 to recognise the contribution of outstanding Australian citizens. These awards recognise people who have made a significant difference to our nation, with recipients honoured twice a year from all parts of Australia and professional backgrounds. The problem is that although the honours are going to deserving people, it’s mainly older, white, professional men who are receiving the recognition – in fact, 70% of the swag. And it’s getting worse, with women receiving even fewer in recent years. And when it comes to the architecture profession, the statistics are far worse. Since 1975, only eleven female architects have been recognised with an Australian Honour. This is a shocking statistic. Out of the thousands of outstanding practising women architects, and the many more who have contributed to the profession over the past four decades, that’s it: eleven women! Statistically, that means on average it is only once every four years that a woman architect receives a ‘gong’. Women in architecture are missing out on national recognition, along with the nation’s gratitude for all their incredible work, which is literally changing the landscape of our country. It’s another way the work of women in architecture remains invisible. We all know amazing women from a range of backgrounds who are contributing outstanding service to our country; service that is above and beyond their paid job. Across your profession, I am sure you could quickly name several women architects who have made a significant contribution locally, regionally or across Australia. You may also know women who deserve to be recognised for their expertise and achievements, not just within a traditional architectural practice but through other, architecturally related activities (such as teaching or mentoring). But these amazing women probably haven’t yet been recognised. Why? Maybe because you haven’t thought to nominate them. It’s not fair. But you can change this by submitting a nomination for an outstanding woman in your profession. Why should the blokes get all the glory? If you are thinking of nominating a more senior woman, perhaps a respected older leader of the profession, please do this before it’s too late. Honours are not awarded posthumously. It’s far better to write a nomination than an obituary! From left: Carol Kiernan, Minister for Women Kelly O’Dwyer, Dr Elizabeth Hartnell-Young and Ruth McGowan. Need support? Think about starting a sub-committee of peers to help you. Tap into the #HonouraWoman Movement, which I co-founded last year to push for gender equality in the Australian honours along with Dr Elizabeth Hartnell-Young and Carol Kiernan. Our aim is for 50:50 gender equality in the awards by the year 2020. With your help we can get there. Here’s our Facebook page. If you need more help in completing the nomination, Our Community provides an excellent resource, Advancing Women. So, what are you waiting for? Get going and get that woman architect a gong! Ruth McGowan OAM received an Order of Australia in 2014 for community service. She believes in ‘passing it on’ and in 2017 she co-founded the Honour A Woman movement to support Australians to nominate a woman for an Australian Honour.